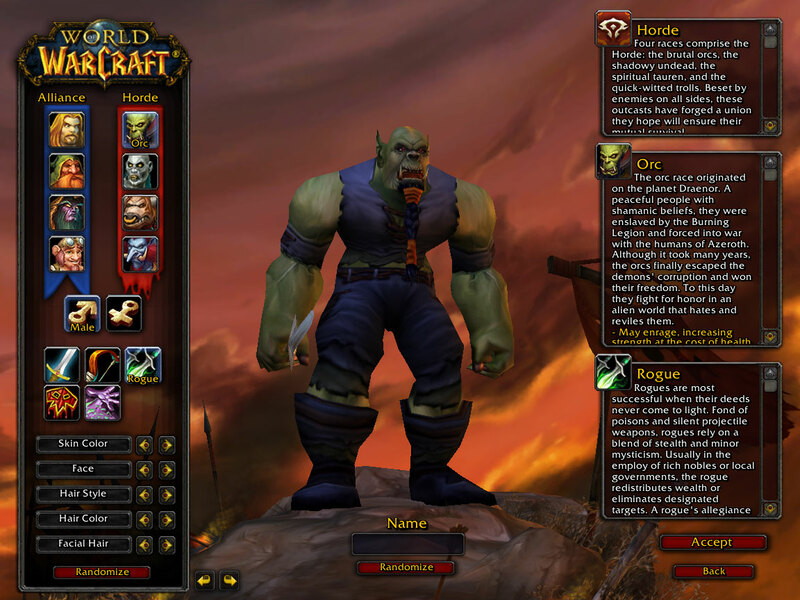 In World of Warcraft players create a character to control in a virtual fantasy world full of dangerous monsters, exotic locations, and people who need help (Blizzard Entertainment, 2004, guide). Each player chooses a type of character class to play (e.g. a brawny warrior, a backstabbing rogue, a devout healer). As a player journeys through the land with his or her character, completing quests and defeating monsters, the character accrues “experience points” or “XP.” After a certain amount of XP, the character advances an “experience level” and becomes more powerful. Additionally, the corpses of monsters which are defeated can be looted for valuable items (known as “loot”) which may help characters outfit themselves and be better prepared for future encounters. Characters start out at level one and can (currently) advance to level 60, when the stakes become much higher in terms of danger and rewards. Eventually, however, most players discover that, in order to continue to advance efficiently, they will need to team up with other players who are working on completing the same quests and defeating the same monsters. To team up, the character joins a “party,” a group of up to five characters. Generally, the party goes to the same places and works on the same quests together. 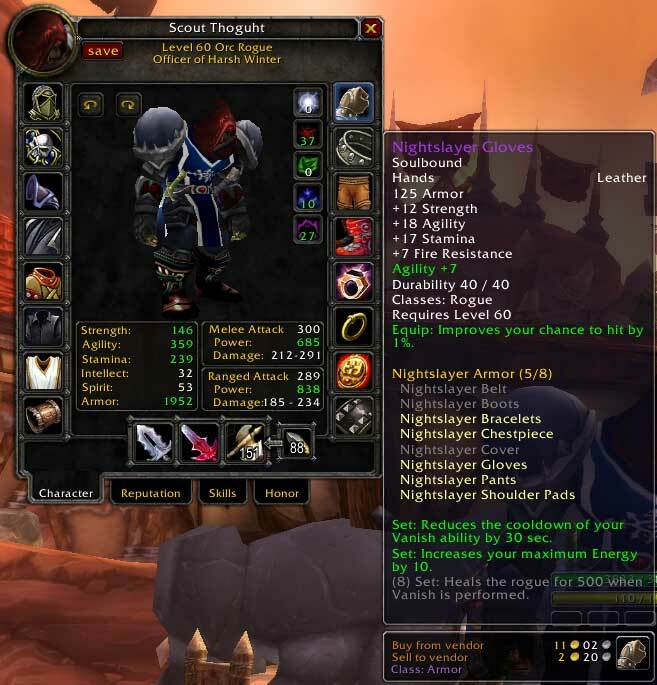 As a character approaches or reaches level 60, he or she can go into the most difficult dungeons. These require special groups called “raids” or “raid groups” which can have more than 5 characters. Molten Core (MC), the dungeon my group has been going to allows 40 of us to go at the same time. For some of the encounters a group will face, it is important to compose the party or raid with favorable proportions of the different character classes. For example, it is often useful to have a warrior in the party to take the brunt of the blows from the monsters since a warrior has high stamina and is allowed by the game to wear plate armor, and it is also important to have someone who can heal the other party members when they take damage. Some encounters are much easier with certain group compositions. This is especially true in a raid group attempting to clear a high-end dungeon. It is important to be able to clear out a dungeon in an efficient manner because the dungeon encounters are reset every week. In other words, a group has a week to clear out as much of the dungeon as possible before having to start all over. Once completed, groups are still encouraged to repeatedly visit these high-end dungeons every week because the monsters they defeat drop very good loot, but they don’t drop the same ones each time. In a raid with 40 people, repeatedly killing the same monsters ensures each member is given the loot that they want. Often a character is invited or allowed to join a raid group only if he or she meets the raid’s requirements in terms of his or her character class in relation to the existing composition of the raid. It is not the only factor, however. Generally, preference is given to friends or at least non-strangers who (usually) meet the class requirement. In this way, the roles players assume are as much determined by their character classes as by their social situations in relation to the other players and their ability to argue for certain ways of playing.